Plus i never even put that much of a load on the CPU. The highest i over clocked it to was 3.50 GHZ and it immediately blue screen upon boot so its not like i was running it consistently OC at 3.50. I was running it consistently at 3.33 GHZ though for a while with no hiccups. I even monitored my hardware temp and everything was normal. So i doubt OC caused this but like i said who knows. I think this is just a dark cloud that is following me around. With my luck there is probably a microscopic hair on one of my processor pads that is some how amazingly causing a random boot hang with my PC or maybe its the temperature in my room or my PS3 that sits next to my PC causing some type of EMI that is causing the boot hang? Can you guyz tell im getting a little delirious over here? pff hahaha..
Edited by l0stb0y760, 19 June 2009 - 02:43 PM. Wait, your telling me you have been using an overclocked CPU the whole time? No, I was just saying I have done some over clocking in the past. But ive been running everything on default since trying to solve this issue. I regrounded my mobo, didnt help. I unplugged everything from my mobo and ran the BARE minimum hardware (mobo, one HD, one keyboard,power supply, one stick of RAM) and thats IT. System hung again after about 15 reboots. Have not tried a reformat but I really dont have the time for a reformat right now plus i doubt that would fix this. The only hardware left it could possibly be is my mobo, my main HD, processor and i suppose the Ram is still a suspect since i have not replaced it. However memtest is testing it clean. I am kind of at a loss right now though as i cannot afford a new processor, HD or mobo at this time. Im just gonna have to deal with it. Its not a HUGE problem anyway just a real annoyance as i said in the beginning of this thread although it does seem to have gotten worse. Sometimes the system will hang after about 5-8 reboots and sometimes i wont see the problem happen till after about 16 reboots..so i duno. I will let you guyz know if i make any further progress on this issue. Still gotta check into the diagnostic utilities edge was suggesting. Were you only OCing the CPU or were you also doing it with RAM and your GPU? Run the utilities when you have a bare minimum system. You could try reseating your CPU and making sure that all cables are firmly connected. Open it and post the temps and voltages on the right and bottom respectively. You might want to reformat and reinstall although I suspect a hardware problem. ive been trying to ignore this problem in hopes that it would magically disappear but shockingly it hasnt. Kinda like how i thought i could make this girl like me and shockingly i couldn't. 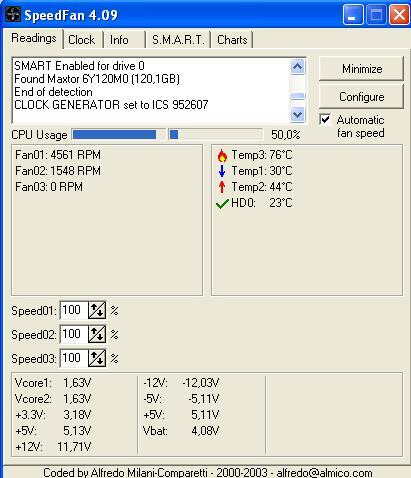 Temps from the speedfan look good as far as i can see. I even have my own temp monitor that is also reporting temps okay. Still have not looked in to the ultimate boot cd but i think i have narrowed down the problem to hardware for sure. Ive come to this conclusion because i popped in a completely different HDD and did a fresh install and on the 9th boot system hung again right after POST. Being as ive ran bare minimum hardware this points to again three components. The RAM, the CPU or the MOBO. Im ruling out the HDD since ive tested with two different HDD's and I know there both good (ran data life guard diag. on both). The RAM tests okay as well according to Memtest but I have not tried using completely new RAM (because i have none handy, but maybe that is still an option). My best estimate at this point is that the faulty hardware component is between the Mobo and the CPU and if i had to take another estimate im thinking its my mobo. Unfortunately i cannot afford to replace either of those at the moment so i will just have to deal with this problem for now. Its not so bad anyway being as it only happens like after 9 boots or so and i can just hit the restart button and it comes back up normally so w/e. Thanks for everyones help and suggestions especially edge2022 and diabillic. Feel free to post if you have any other thoughts comments or suggestions. When i get around to either swapping the CPU or Mobo ill let you guys know what the culprit was, until then have a drink for me guyz..cheerz! Edited by l0stb0y760, 28 June 2009 - 10:25 PM. If I were to make a suggestion now, it would be to have your mobo and CPU looked on by a shop. They can do a couple of tests on them to make sure that they work fine. How about the voltages from Speedfan? Can you post them? NVM... just saw your picture. If you can get a new mobo or CPU, I would like to know the outcome. Another thing you can try... although this probably isn't the problem. If the problem is software related (on the very off-chance) you can use Ubuntu (try a HDD install and a Live CD) for a couple of reboots and see if the problem crops up again. Edited by edge2022, 28 June 2009 - 10:32 PM. Hmm ya, i really hope its the mobo because im lookin at about 50-100 bux. If its the processor on the other hand then im really screwed, 150-200 bux (since i wont settle for anything less then a dual core 3.0 GHZ). And with my luck its probably my processor. I suppose the Ubuntu route is another thing to try but honestly im exhausted and really feel its hardware. I mean i tried a different HDD with a fresh install and it still hung? pssh..This issue has already exhausted me, ive seriously gone bald frm pulling out my hair already. If this was a customer's computer i think i would of told them to just trash their PC by now and go to mac. Customer ''did you find out the problem ?''. l0st ''yesssir the problem is your SOL and your PC is on some type of crack, youd be better off just trashing it''. haha okay all joking aside, ill see what else i can do. But i think im gonna go for the new mobo option. But have to be careful because i could be buying a mobo that is not gonna fix this and therefor wasting my money, -sigh. Edited by l0stb0y760, 28 June 2009 - 10:45 PM. You need to be sure that your mobo is the problem. Having a pro look at it, and running stress tests can usually tell what is the problem. It's swap and repair installation. Remember to apply the thermal paste, mount the fan and heatsink correctly. Roger, well that will be my next step. I'll get to that sometime this week for sure (or as soon as i can) and keep you posted, thanks. If it is boot hang free after the cpu swap then would you agree we can blame my core 2 duo processor? i think so.. If it is boot hang free after the cpu swap then would you agree we can blame my core 2 duo processor? i think so.. Yes... I would blame the processor if that is the case. Hope to see your results soon! Getting some interesting results here which I dont quite know what to make of at this point. I replaced my CPU with a P4, booted up worked fine. I rebooted about 8 times and was able to replicate the problem again. So im thinking o cool, gotta be my mobo now. So i slapped my old Core 2 Duo CPU back in and rebooted 20 times (testing out of curiosity) and have NOT been able to replicate the problem..? Usually i am able to replicate the problem for sure before hitting 20 reboots, so this is weird. I still think its the mobo and its just a coincidence that ive been able to reboot 20 times with no problems. I will continue testing tonight with my old CPU installed to see if i can get the problem to repeat. If it does happen again im replacing the mobo. Its almost like reseating the processor might have solved this? Strange. But that wouldnt make any sense because i completely replaced my processor with the P4 and still had the problem.? Unless JUST maybe the P4 is bad? who knows. But if it happens again im replacing mobo like i said. Edited by l0stb0y760, 07 July 2009 - 01:00 PM. I really was hopeful after reading your first post after you replaced the CPU. Looks like it's a mobo problem then... if that doesn't fix it, I don't know what will.